Learn how to grill a turkey on a charcoal grill even if you have a big turkey! The smokey flavor is fantastic for your holiday dinner & amazing in leftovers. Yum! This post was nearly titled “How I spent $200 on a Thanksgiving turkey”. For years I wanted to cook Thanksgiving turkey on the grill. It makes so much sense, doesn’t it? Grilling a turkey keeps the oven free for keeping side dishes warm and grilled meat always has an extra layer of flavor that can’t be beat. Unfortunately, we only had a gas grill with spotty temperatures. But then invested in a Weber charcoal kettle a couple years ago and last year I finally got to learn how to grill a turkey on a charcoal grill for Thanksgiving dinner. We started by calling a local turkey farm to order our 12-pound bird for Thanksgiving day. With limited space inside the grill, we figured we couldn’t handle anything much larger, and we were only having 5 adults at our Thanksgiving dinner anyway. You know what they say about the best laid plans, right? When the Husband went to pick up our lovely 12-pound bird, he found instead that we ended up with a large 18-pound turkey. That bird was huge. There’s no way that turkey was going to fit inside our grill. The Husband was convinced that we had to bake the turkey after all. But I was not to be deterred. Our entire Thanksgiving timeline and menu was planned around having a grilled turkey and I was determined to figure out how to grill a turkey on a charcoal grill – even if that blasted bird was too fit for the grill itself! That’s when the husband recommended buying a Rotisserie Grilling kit on Amazon. And since Thanksgiving was so close, we would need to splurge for next day shipping. Our super-sized organic turkey wasn’t cheap, and adding the rotisserie kit would increase the price of our Thanksgiving turkey to more than $200! I just couldn’t stomach the thought. Then I had a brilliant…but risky idea. Back in 2011, I made an awesome rocket ship pizza tray for a party, the nose of which was covered in a small bit of aluminum flashing. We still had that 10-foot, $10 piece of flashing in storage. Using it between the bottom and top of the grill added plenty of height to fit the jumbo turkey. We took the risk and cooked the turkey with the flashing in place. And it worked!!! Best of all, it was the best turkey I’ve ever tasted. 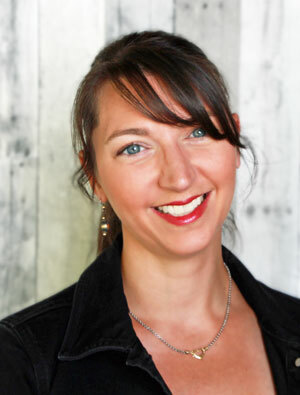 And now I get to share with you how we did it! Learn how to grill a turkey on a charcoal grill even if you have a big turkey! The smokey flavor is fantastic for your holiday dinner & amazing in leftovers. First thing's first: No lighter fluid. Get a chimney starter. The flavor is so much better. Don't use wood chips. Big hardwood chunks are great for long-smoking applications. Big chunks don't require soaking and smolder longer. Our experience also indicates that big hardwood chunks impart a stronger smoke flavor to the meat. Use a remote thermometer to keep track of the temperature of your meat. This way you don't have to let heat and smoke escape just to check temperature. Place an aluminum pan in the center of the grill to catch fat drippings. This helps to prevent flare-ups and also makes clean up a little bit easier. Fold a paper towel into a square and use it to lightly oil the grill grates to help avoid sticking. Prepare your charcoal in the chimney starter. Place charcoal inside the grill. Put the drip pan in the center of the grill, directly on top of the coals. Put the turkey in the center of the grill, above the drip pan and insert the remote thermometer probe into the turkey breast. Arrange the aluminum flashing around the perimeter of the grill, between the grate and the sides of the grill. Place the lid of the grill on top of the flashing. Don’t worry, the flashing is strong enough to hold it up. Replace the coals about once an hour, or as needed, aiming to keep the grill below 300 F. Always wear protective gloves to remove the flashing during this process. 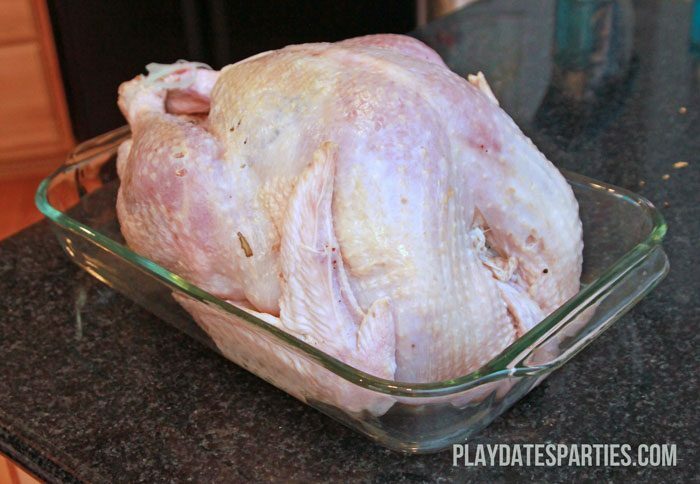 Sadly, you won't get a lot of drippings from the turkey with this method. Plan another base for your Thanksgiving gravy. We tried this technique again with a smaller turkey, and found that the flashing had warped from using it last year. This meant that we ended up with extremely high grilling temperatures. Thankfully a 15 pound turkey fit under the grill lid with no problems. The flashing method worked perfectly for us the first time, but be sure you’re prepared with a backup plan. 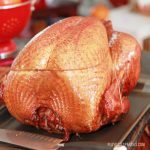 Keep your oven and crockpot clear for the side dishes this Thanksgiving and follow these directions for how to grill a turkey on a charcoal grill. 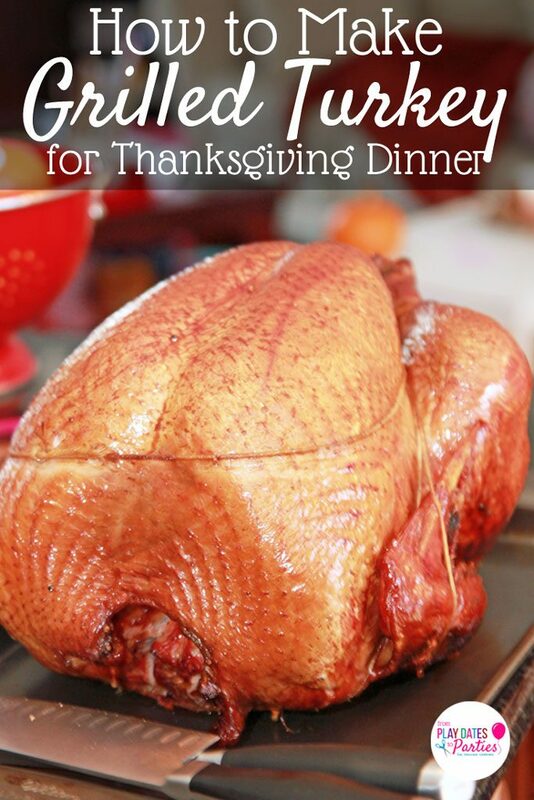 This easy recipe makes the perfect turkey with tender, juicy meat that is amazing for leftovers. You’ll never want to make Thanksgiving turkey in the oven again. What’s the biggest thing you’ve ever grilled? 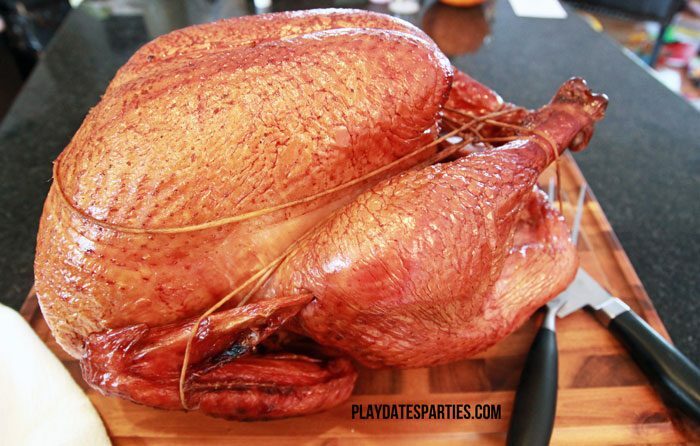 What’s the best turkey preparation you’ve ever had? Oh wow, that looks amazing!! I’ve just never thought to do it that way. Oh man…I bet this is amazing! YUM!! Great instructions! Thanks for sharing at the What’s for Dinner party! What a great idea! We started using a counter top roaster for our turkey a couple of years ago just to free up the oven… but last week just for a family dinner we tried cooking a turkey breast in the crock pot and after seeing how amazing that tasted we might try and use the crock pot this year (unfortunately my grill would not be big enough for a whole turkey!). I’ve heard about using the crock pot for Thanksgiving turkey, too! We like to use our crockpot to make pumpkin pudding. (So yummy) Thanks so much for stopping by!